Judy Baker has coached the Canada Deaf Swimming Team for the last four years and she praises her swimmers. However, the focus for the rest of this year and a good part of 2019 is clear. To perform well at the World Deaf Swimming Championships in August 2019, the priority for swimmers is training in and out of the water. It means that Baker must make sure each athlete is training in an optimal environment that includes at least six weekly pool training sessions and three dry land sessions. These can include gymnastics, yoga, martial arts, running, and weights. “It is also important that swimmers stay injury-free between now and the World Championships as well as take part in at least one competition on a monthly basis starting in January or February,” said Baker, who swam for the National Team as well as for the Simon Fraser University varsity swimming team in British Columbia. Baker’s goals for the team at the World Championships is for each swimmer to make it to the finals and rank in the top 16 in their best events. This also includes team relays and each swimmer to beat their own personal best. “I would also like that swimmers have fun and enjoy the international experience while meeting new Deaf and hard of hearing friends from all over the world,” said Baker. Born in Saskatchewan, Baker has always enjoyed being in the water. She grew up in Thunder Bay, Ont., where she started to swim seriously at Lakehead University with her sister under world-renowned coach Don Talbot. Talbot worked with several Olympians and Gold medallists. When Talbot quit the swimming program in 1978, Baker moved to Vancouver. Since then, she never stopped swimming and began a coaching career in 1981 to help cover her university costs. 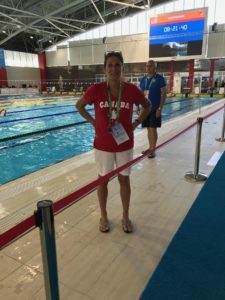 Baker’s journey with Deaf swimmers started when the son of one of her master swimmers competed at the 2013 Summer Deaflympics in Bulgaria for the Canadian Deaf Swimming Team, and she heard all about the great experience he had. “I felt the sport of swimming had given me many opportunities to grow, experience and develop as a person. I felt I could volunteer my time and give back to a very worthy cause. I also felt I had a lot of knowledge and life experience as an athlete that I could share with these athletes,” said Baker. She then applied for the coaching position with the Canadian Deaf Sports Association in 2014 and got it. Baker thinks highly of the swimmers on the team. They are very smart, adaptable, determined, hard-working and make a difference daily by swimming and living in a hearing, able-bodied sport. “It is an honour to be humbled every day by these determined and dedicated swimmers,” she said.